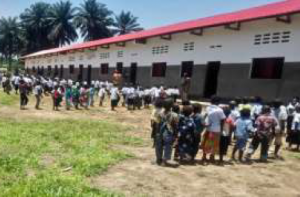 This has been a good year for building schools in Congo! Congo’s Children and Families have much for which to be thankful, especially the generosity of any churches and individuals who funded the building of 2 schools in the Kasai provinces this year – Baolongo and Bambuyi. The school to the left is at Bambuyi. Save the Date for the 2018 Congo Mission Network Conference! Please join us as we connect around supporting various ministries and areas of development in the Congo, while exploring methods of peacefully advocating for change in the DRC! Download “Save the Date” flyer and a 2018 CMN brochure! A New 2017 CMN Publicity Brochure is available! Anne Crane recently updated our 2017 Congo Mission Network brochure and it is now available for you to download and use to share about our activities. The brochure is a 3-fold brochure designed to be printed on letter paper (landscape). Please click below and download it and use it in your church! The Congo Mission Network (CMN) is a grass-roots organization affiliated with the Presbyterian Church, U.S.A (PCUSA). Our goal is to partner with the Presbyterian Church in the Democratic Republic of Congo (CPC) and the Presbyterian Church of Kinshasa (CPK) to help the Congolese people improve their lives. To find out more, please visit our about page.